We have now finished moving to our new offices based in Shirley, Solihull. Recognised as a high growth business by Business Link, and with a number of new contracts secured and with others being negotiated, our new much larger office base will give us the capacity to support our growth. As well as having more space, the premises at Highlands House afford us improved parking, larger meeting facilities and a well equipped dedicated Control Room. Although our postal address has obviously changed our telephone, fax and email contacts remain unchanged. 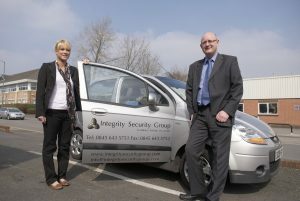 Integrity Security has been appointed to provide manned guarding to a large privately owned Industrial Park. 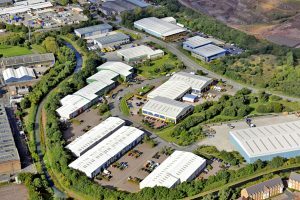 The Park comprises of 23 industrial warehouse units on a well managed estate suitable for a range of industrial and warehouse uses. Integrity Security provide a four person team to man the purpose built Security Tower around the clock at the industrial estate which lies south east of Walsall Town Centre. Integrity has recently joined the British Security Industry Association as a Principal Member. The British Security Industry Association is the trade association for the professional security industry in the UK. Its members provide over 70% of UK security products and services and adhere to strict quality standards. The BSIA’s top priority is the maintenance of high standards within the industry, and it places rigorous requirements on companies wishing to become members. The BSIA is the only trade association that requires its members to be independently inspected to the quality standard ISO 9001:2000 with a UKAS accredited certification body. Along with our many accreditations, membership of the BSIA provides an assurance to clients that Integrity is a quality driven and professional company and allows us to tender for a wider range of contracts. 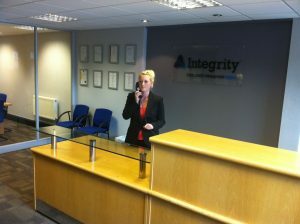 Integrity have now appointed an apprentice through a scheme backed by Birmingham Council. A very warm welcome to Hannah Sheldon who is working in the office providing administrative support. The apprentice scheme has provided Integrity with the opportunity to bring in Hannah on the bottom rung so she can develop and grow with the business. Integrity Security Group has achieved the prestigious international award for good quality and environmental performance ISO9001 and ISO14001. This was the accumulation of six months hard work and follows on from ISGs involvement in an initiative run in Spring 2009 by Solihull Metropolitan Borough Council called “Solihull Engages in Environmental Management” (SEEMS). The project was part funded by Business Link grant and the certification was granted by UKAS accredited body ISOQAR. ISG felt it was important to achieve ISO9001 and ISO14001 recognition to promote its credentials to its clients and give ISG an marketing advantage. It also reflects ISGs principles of high levels of customer satisfaction whilst minimising harm to the environment. ISG have already achieved the prestigious Safe Contractor accreditation demonstrating to clients and potential clients alike that they can be confident that ISG work to the highest standards of health and safety.